It's been two weeks since my 18th birthday and today I'll review a book that was gifted for that occasion. I want to thank my friend, Nina, again for giving me this book! Thanks! This book has been on my "want to read list" for what seems like ages and now I could finally put it to the test: Alienated by Melissa Landers. And I can already tell that this book is wonderful! This is only my second story that has aliens in it. My first story ever read with aliens was the Lux-series by Jennifer L. Armentrout and I never thought another Alien than Daemon could steal my heart. Yet I found myself in such a great story, with such a great alien! But first Cara Sweeney! She's a girl that won't let you play her. She's strong, knows what she wants and straight on. If you want to battle her she'd be honored but would make you lose. She's great at debating and therefore wants to become a journalist. That's also why she opened up a blog with the exchange project. Which we could visibly see in the book and I thought that was very creative as well as so cool! Other than that Cara is the valedictorian and is very intelligent. In the beginning I was a little intimidated by her. She came over as arrogant, a little aggressive but soon you find yourself loving Cara's personality. I liked it that she was honest. She said what she wanted to say and that made her a very strong and expressive character. I'm sure we all know a Cara Sweeney in real life which also made this character really relatable. She won't let people play her, that way we also see she's a very strong woman and we see this on many occasions in the book. But there is a soft side to everyone and also Cara has one. I loved to see this side of Cara most because it's very unique. Most of the time she bites back but when the softer and caring Cara comes along you know some of her harshness is played. She just wants to protect herself from getting hurt. Hurt by her friends mostly which brings me to her friends. Or should I say "friends"? The first character: Eric. What a jerk he is! If I thought Cara was arrogant then what on Earth is he? I instantly hated him. Absolutely loathed him. He acted as if Cara was his and as if she was a thing. That's actually why I hated him most but he's also not as open-minded as Cara. Eric also hated the aliens before he even spoke to one and that slightly bothered my too with this character. I guess that makes me a proponent of aliens! As for Cara's other friend, Tori. I liked her so much! So much! Until it changed... But let's start with the beginning of it all. I liked Tori because we had something in common: we both loathed Eric. This girl was also the opposite of Cara and that reminded me to the statement: opposites attract each other. I think that's the main reason that Tori and Cara came in contact. Tori also looked out for Cara and she's also the one to flip the finger very easily when something doesn't suit her. I liked this Tori, it seemed real and right. Until she decided to have a change of heart and be a damn alien hater! And there's so much more she did wrong. So I became very wary of this character. Now my favorite character of this book, yes the alien: Aelyx. Pronounced as "A-licks". He was so... alien. He didn't like Earth for starters and loathed everything around Earth. The bright colors, the people, people showing affection, the fastfood, actually scratch that... he disliked all food. In the beginning I was a little scared I wouldn't enjoy this alien because he absolutely had an answer on everything that he didn't like. Yet his intelligence made me a bigger fan of him. He also changed and he became the sort of boy I never thought he'd become! It made him seem very interested, unique and evolved which he absolutely is. His whole race is very evolved, maybe a little too evolved. That made it very interesting to me actually. The plot really takes you into the story by using L'eihr vocabulary, L'eihr culture, L'eihr gestures. It is like you are Cara and you're getting to know this new culture and race. You can ask yourself questions and they might be answered by Aelyx. I think seeing more of this L'eihr culture in general was something very nice in this story. But it also made you very suspicious. The exchange students from L'eihr have something planned and that becomes clear because they act strange and use their vocabulary. It makes you wonder what they're up to and what it has to do with the human race because you don't know what they're talking about. Their vocab doesn't even come close to English and that creates the needed suspicion and curiosity with the readers. What made this story more alive and realistic were the many opponents of the exchange project: HALO. Of course there'd be opponents of the alien race, it's foreign and frightens people. And I'm pretty sure many in real life also would be scared and protest for an alliance and that made it very realistic to me and a great asset to the story. Why? Because Cara takes an alien in her house and many people are angry with her. And here's where the thrill comes in! Cara gets threatening notes, she's seen as a traitor. This was something I was very keen on because we saw our main character under pressure and you just wanted to know how she would handle this. Further the story was told in narrative perspective and I'm never really been a great fan of such stories. Yet here I found myself being very happy that it was the narrative perspective. It didn't bother me at all, in fact it was quiet the opposite. I loved knowing the thoughts of both Cara and Aelyx because it made the story more alive to my opinion. If you're convinced in reading this story I'd also recommend you reading the #1.5 story: Until Midnight. It's a short story that takes place between the books Alienated and Invaded. It's not as good as Alienated to my opinion but it does make you want more! The best thing about this is that it's for free! If you want to read it make sure to click here. Melissa Landers' writing style is easy and very fluently to read which makes sure you aren't confused. The characters are great and relatable as well as alive and the plot will make you ask for more. Above that once you read Alienated you've got yourself another book boyfriend which is always a great thing! I absolutely recommend this story because many scenes in this book are absolutely hilarious but you can also feel very frustrated and angry. All the things I've summed up make this book absolutely great! 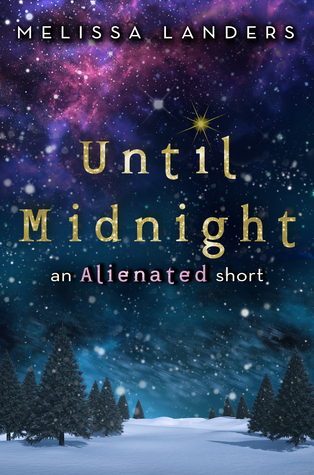 If you already read Alienated and you want to read Invaded, I also highly recommend Until Midnight because it's a nice read in between the books.